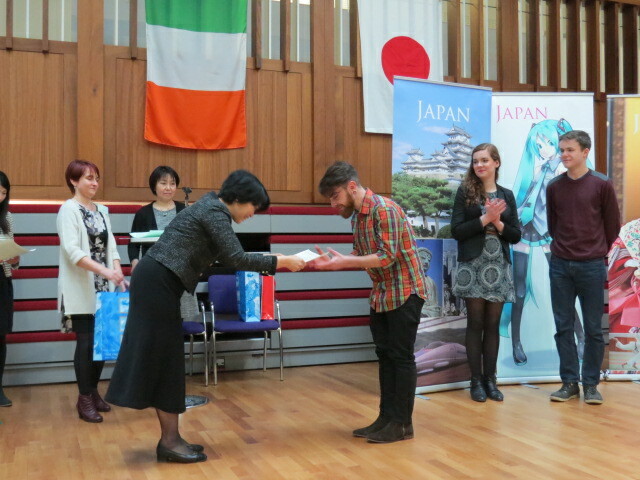 On 4 March 2017, the 15th Japanese Speech Contest in Ireland will be held between 12.00pm and 5.30pm at the FitzGerald Debating Chamber, University College Dublin, Belfield, Dublin 4. 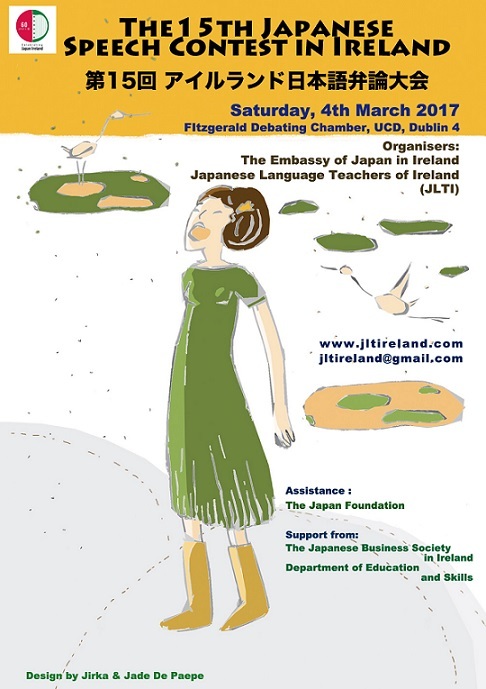 Co-organised by the Japanese Language Teachers of Ireland (JLTI) and the Embassy of Japan in Ireland, and supported by the Japan Foundation and other organisations. This year, 12 participants in the Secondary School Category (TY & LC1 Group), 6 in the Secondary School Category (LC2 Group) and 7 in the General Category will enjoy speaking about Japan and the things that interest them. The participants will be judged on the basis of the content, expression and grammar of their speeches and a Q&A session with the judges. 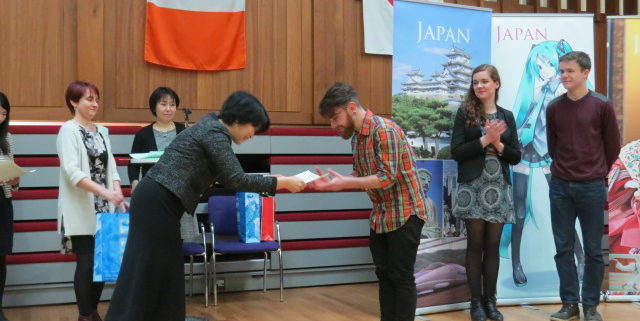 The prize for the winner is a return ticket to Japan, funded by the Japan Business Society in Ireland. To mark the 15th anniversary of the contest and the occasion of the 60th anniversary of diplomatic relations between Japan and Ireland the city of Matsue, where the best known Irish man in Japan, Lafcadio Hearn, lived for a number of years, will host and partially fund two winners from among the secondary school contestants for a return trip to Matsue where they will stay with a Japanese family and experience Japanese culture. In addition, for the first time, several Japanese winners of the 50th Youth Recitation Contest in Honor of Lafacadio Hearn, which is held in Matsue every year, will make a special presentation at The 15th Japanese Speech Contest. In addition to the Speech Contest, the audience members will be treated to a Rokyoku performance by Ms Keiko Haruno. Rokyoku is a genre of narrative singing accompanied by a shamisen, and is one of the iconic styles of the Japanese traditional art of storytelling. Ms Haruno will follow her performance at the Speech Contest with a full concert, including an introduction to rokyoku, two pieces to be performed and the possibility to talk to the artist the following Sunday at 1.00pm in the Aula Maxima in University College Cork. The Embassy of Japan will also have an information desk at the Speech Contest providing information on visiting, studying, working and living in Japan. The Embassy will also host a short reception with refreshments for participants at the end of the Speech Contest. 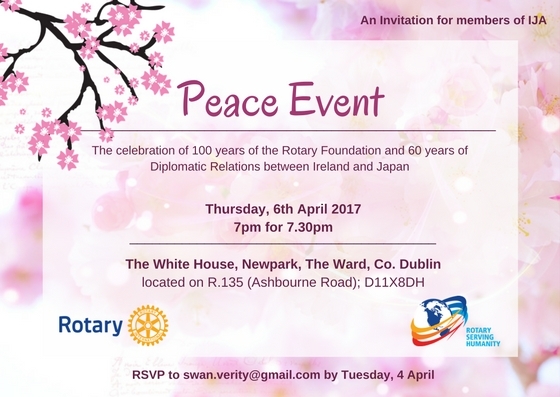 As part of the celebrations of the 60th Anniversary of Diplomatic Relations between Japan and Ireland, which will continue throughout 2017, Mrs Mari Miyoshi, Ambassador of Japan to Ireland will present her commendation to the JLTI in recognition of their contribution to Japanese language education in Ireland in the past 17 years. Dr Keiko Inoue, Chairperson of the JLTI, will accept the commendation on behalf of the group. Ambassador Miyoshi said, “I hope that through learning Japanese students deepen their understanding of Japan and the facets and charms it has culturally, technologically and economically”, and continued “2017 marks the 60th anniversary of diplomatic relations between Japan and Ireland. In 2019, Japan will host the Rugby World Cup and, in 2020, the Tokyo Olympics and Paralympics will take place. I hope a lot of Irish people will take these large international events as an opportunity to visit, see and experience Japan”. According to the latest Survey on Japanese-Language Education Abroad 2015 conducted by the Japan Foundation, 3,213 Irish people study Japanese, which is an increase of 14% from the previous survey conducted in 2012. These students are mainly found in around 40 secondary schools and five third level institutions throughout Ireland. The contest started in 2003 and is organised by the JLTI. This year’s contest is the 15th organised by the JLTI, and the fourth to be co-organised by the Embassy of Japan. Every year, about 30 contestants take part in the contest which attracts an audience of around 200 people. See Event Timetable and Map here!